Junsu of 2pm has finally fully recovered from his knee injury and will be joining 2pm and the Wonder Girls on their US Tour. Junsu recently tweeted on twitter on the 12th KST "I just arrived in LA". Junsu was able to participate in Wonder Girls' LA Concert at the last minute at June 11 8pm American Time as 2pm were the opening performers for the concert. Junsu will be joining with 2pm on the 12th at Anaheim and on the 13th at San Francisco. 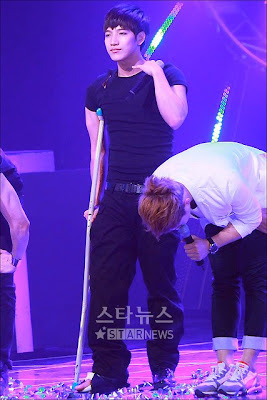 Junsu of 2pm suffered a Knee Injury last May and had to perform in crutches and bandages. Accordingly, he wasn't able to Join in the US tour with 2pm last June 4 due to his knee injury as it might worsen his knee injury which is recovering but recently, he has recovered from his Knee Injury and will be joining in with 2pm and Wonder Girls on their American Tour.